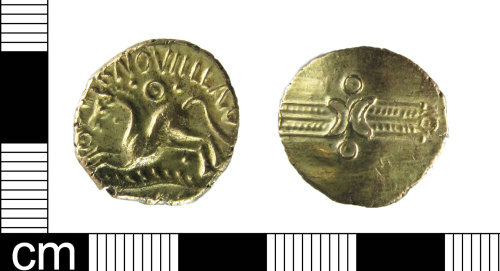 Gold stater of Dubnovellaunos, c. 5 BC - 10 AD. ABC 2392, VA 1650, BMC 2425-40. Obverse is wreath with outline crescents back to back at centre. Pellet in ring above and below, pellet in ring at one end of wreath.